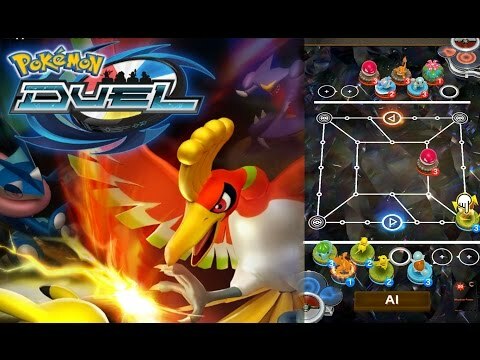 And today we have an interesting game here – Pokemon Duel by The Pokemon company We all remember the Pokemon GO madness and we know that secretly every one of us was playing it. I admit that I was one of those people. Right here we have something a little bit different and yet not so much different. Imagine a Pokemon Go version but focused only on the battles between this adorable creatures. The rules are simple yet with more playing of the game, you see that through this simplicity everything is starting to be harder and harder. The game starts with a traditional tutorial, which is very helpful and will guide you through the process of learning the simplest concepts in the game. The story behind it is not as entertaining as the game itself and will give you a very basic introduction to the duel concepts that will be seen in the gameplay. The most important thing here is to prepare new players for a popular championship described as the Pokemon Figure Game World Championship. The gameplay is really very simple. Basically, you have to stop the pokemon entering your end of the game zone. The game is the western version of Pokémon Comaster, which hit the Japanese public in April 2016. All online battles happen in this same scenario and the key to achieving your main objective is not only to win battles, but also move fast through the opponent’s Pokémon. Each side of the board is represented by a player, who can arrange their Pokémon according to their strategy. Once a match starts, you should move figures until they reach the opponent’s side, while making sure that your enemies stay away from your side. The first player able to reach a central point on the board with a miniature character wins the match. Easy as that but believe, you should master this “easy” game. Too many pokemon and strategies to control. Too long waiting time in opening rewards. Please choose one of the 5 best emulator software. I think this is a nice game, especially if you are a fan of Pokemon games!